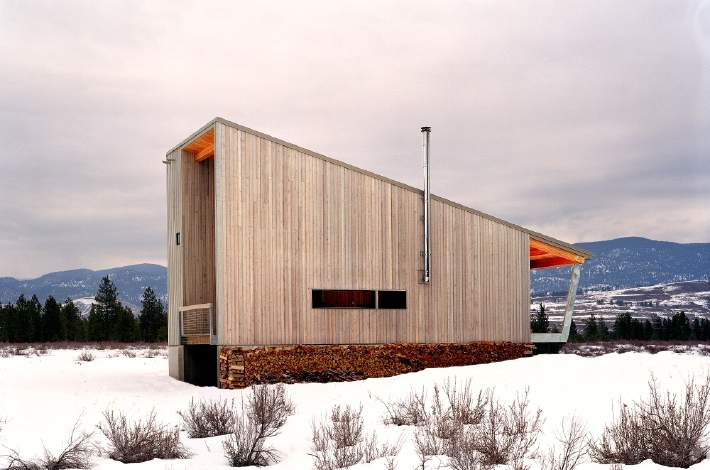 Situated on a sparse meadow right in the heart of Washington ski country, the Methow Cabin may be lilliputian in size but packs a big punch when it comes to purpose. 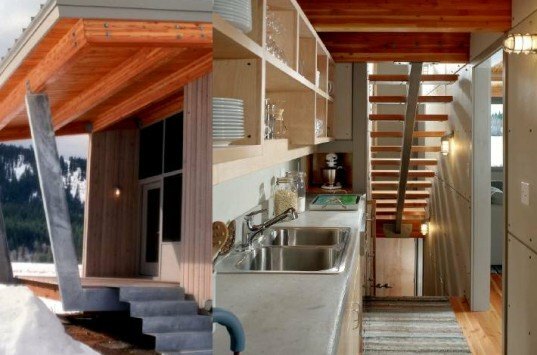 Eggleston Farkas Architects, whose innovative work we've featured before, designed the getaway for a group of skiers who wanted to use it as a base for their outdoor activities. Besides its tiny footprint, the cabin employs some thoughtful sustainable features such as natural ventilation, solar shading and energy efficient heating. The cabin sits adjacent to the cross-country ski and bike trails that the owners love to enjoy, and is in close enough that they can pretty much step out the door, strap in, and go. Despite its diminutive size, Methow was built to have enough room for 6-8 guests to gather, cook and eat. Eggleston Farkas accomplished this goal by designing the house with a dramatically sloped roof that creates a loft bedroom right above the communal space. The slanted shed roof also serves as a way to prevent leaks by letting accumulated snow slide right off. We were already impressed with the Methow’s small and efficient volume, but were interested to see what other sustainable features may have been applied. Allan Farkas was kind enough to get back to us with a slew of other eco considerations such as natural ventilation, a wood stove (heat from the stove rises to the sleeping loft so there is no forced air heat/AC system), a minimal use of applied finishes, a limited use of glass area to prevent heat loss (and the glass used is argon-filled, Low-e) and solar shading/overhangs. Because the cabin sits on such a pristine patch of land, care was also taken to restore the native vegetation at all areas disturbed during construction with the exception of the building footprint and the driveway. With winter coming our way, we think the Methow is a lovely alternative to unnecessarily massive ski cabins, and the perfect little spot to cozy up with a cocoa after a day on the terrain. This looks very interesting, but at no point is the actual footprint measurements or active floorspace measurement given. There's nothing in the photos to provide that sort of context, so this could be 10x30 or 30x100. Some help? The cabin sits adjacent to the cross-country ski and bike trails that the owners love to enjoy, and is in close enough that they can pretty much step out the door, strap in, and go. Despite its diminutive size, Methow was built to have enough room for 6-8 guests to gather, cook and eat. Eggleston Farkas accomplished this goal by designing the house with a dramatically sloped roof that creates a loft bedroom right above the communal space. The slanted shed roof also serves as a way to prevent leaks by letting accumulated snow slide right off. We were already impressed with the Methow's small and efficient volume, but were interested to see what other sustainable features may have been applied. Allan Farkas was kind enough to get back to us with a slew of other eco considerations such as natural ventilation, a wood stove (heat from the stove rises to the sleeping loft so there is no forced air heat/AC system), a minimal used of applied finishes, a limited use of glass area to prevent heat loss (and the glass used is argon-filled, Low-e, and solar shading/overhangs. Because the cabin sits on such a pristine patch of land, care was also taken to restore all of the native vegetation at all areas disturbed during construction with the exception of the building footprint and the driveway. With winter coming our way, we think the Methow is a lovely alternative to unnecessarily massive ski cabins, and the perfect little spot to cozy up with a cocoa after a day on the terrain.